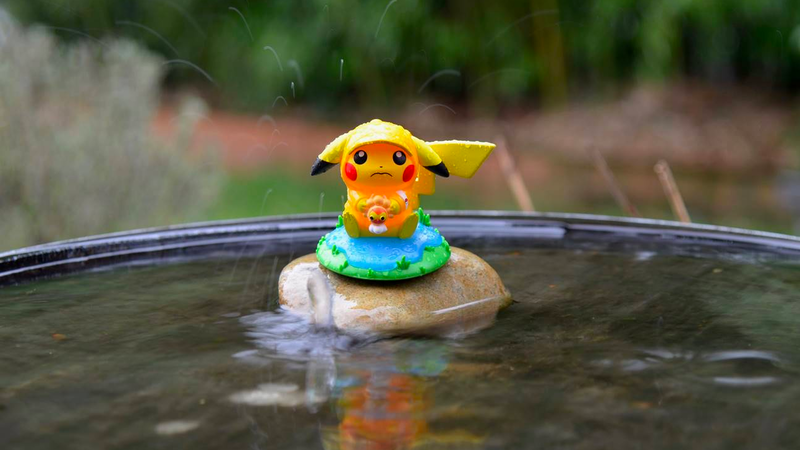 The 'A Day With Pikachu' line of figures continues with an adorable Pikachu stuck out in the rain. 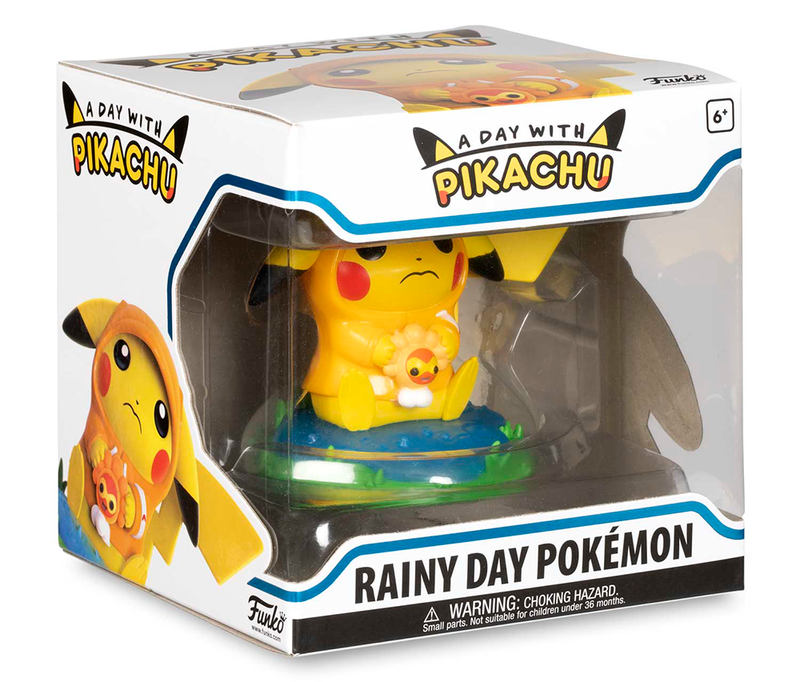 It’s been just over a month since the first “A Day With Pikachu” Funko vinyl figure, One Lucky Day, was released, and we’ve now gotten our hands on the next figure in the line: Rainy Day. 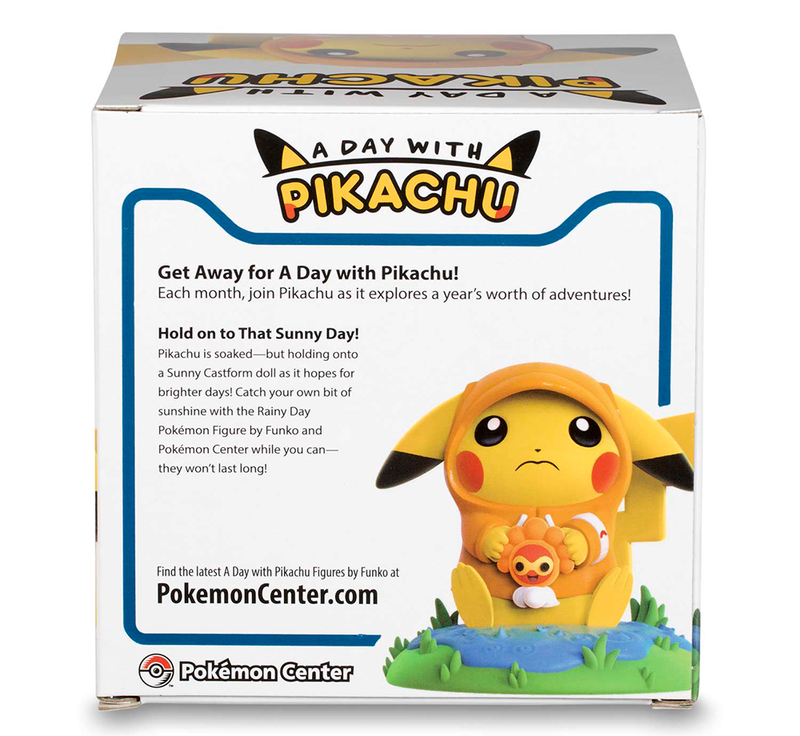 What is the “A Day with Pikachu” line of figures? These aren’t your typical Funko Pops. They don’t have the black-dotted eyes that Funko fans know. With a hard focus on seasons and holidays, these Pikachu figures are detailed and adorable as can be, with each fitting a theme. For instance, to celebrate St. Patrick’s Day, the One Lucky Day figure came out in mid-February and was a shining example of the great, quality work that Funko can produce. Future figures may focus on holidays like the Fourth of July and Halloween. What’s included with the Rainy Day figure? The box is just like the one that came with One Lucky Day, being made of the same type of material (with the same cardboard thickness) that’s usually reserved for Funko’s Pop line. As for the figure itself? It’s adorable! 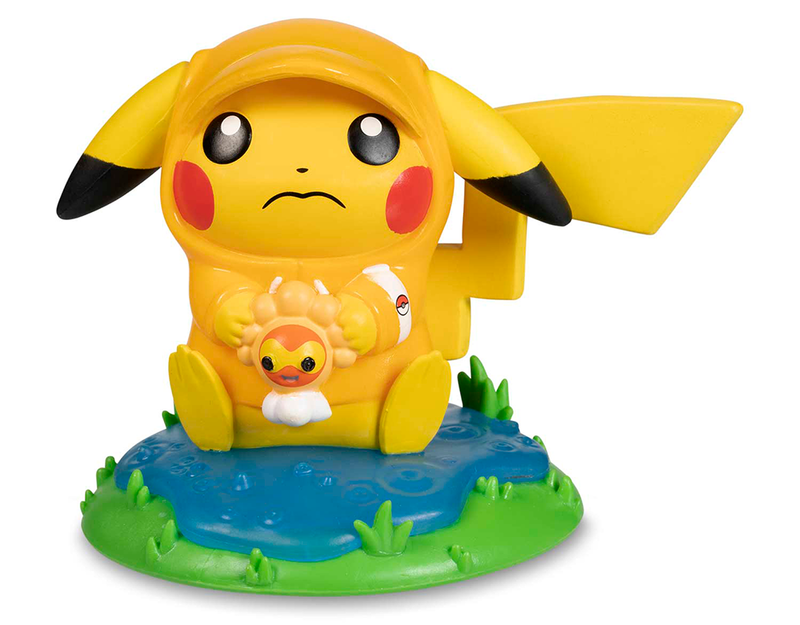 Clearly, Pikachu’s luck ran out after his “one lucky day.” This sad little Pikachu just wants the day to be sunny, but there it sits, soaking wet in the rain while wearing a tiny raincoat and clutching a doll of Castform in its “Sunny” form (which players of the game would get a chuckle at). This version of Castform only appears on sunny, cloudless days. Clearly, Pikachu wants the doll to make the rain go away. It’s okay, little Chu! You are my sunshine! Tell me about the quality. Most people know Funko from the Pop vinyls, but the company has multiple lines of collectibles. One that stands out in particular is a limited line of high quality, screen-authentic vinyls that are produced in partnership with Pixar. The first figure was of Bao, which is from the Pixar short film of the same name. A vinyl based on the short film Presto also comes to mind. These figures don’t come with the beady eyes of the Pop line or the big eyes of the 5-Star line. They’re more of an accurate representation of each character. The A Day With Pikachu line falls more on that side of the court. That being said, this figure isn’t perfect. If you’re looking for the top quality that one would find from Quantum Mechanix or Sideshow, this isn’t for you. At first glance, nothing really stands out, but looking much closer shows paint defects and missprays. The issues aren’t super noticeable when the figure is in the box, or when it’s being held in your hand, but we did notice an imperfection when looking at the edges of Pikachu’s eyes. As Funko Pop collectors may know, this is pretty common and shouldn’t bother fans that are just interested in the figure for the nostalgia or collectability factor, nor the kids that want something adorable on their shelves. Now that February and March’s releases are out of the way, we still have ten figures to go before the end of this lineup. The next figure will be called “Blooming Curiosity,” which should go along with this month’s “April Showers bring May flowers” theme. These figures are very difficult to get your hands on. If the One Lucky Day Pikachu is any indication of how The Pokemon Company plans to launch these figures in the future, they will be available on the official Pokemon Center website first, and will generally sell out within the first hour of their availability. Then, the figures will be restocked on the website a couple of weeks later, and sent to brick-and-mortar ThinkGeek stores and some larger GameStops. The second round of Pokemon Center stock for the One Lucky Day figure lasted for around a day (and was added without warning), so you’ll need to keep an eye on the website to make sure you can get your hands on future vinyls. The Rainy Day figure is just as cute as its predecessor, albeit cute in a different way. The quality is pretty close to the last one as well, even if it’s not perfect. Funko collectors and Pokemon fanatics should both be proud to have any figures from this line in their collections. Disclaimer: The Pokemon Company sent SuperParent a Rainy Day figure to review.